Happy Christmas people, or at least almost! Well, that was a handful! I hope it can bring you some inspiration if you’re still wondering what to make for yur Christmas gatherings. Now please have a look at this video I made for you all where you’ll see me preparing the recipe you’re really here to check out! 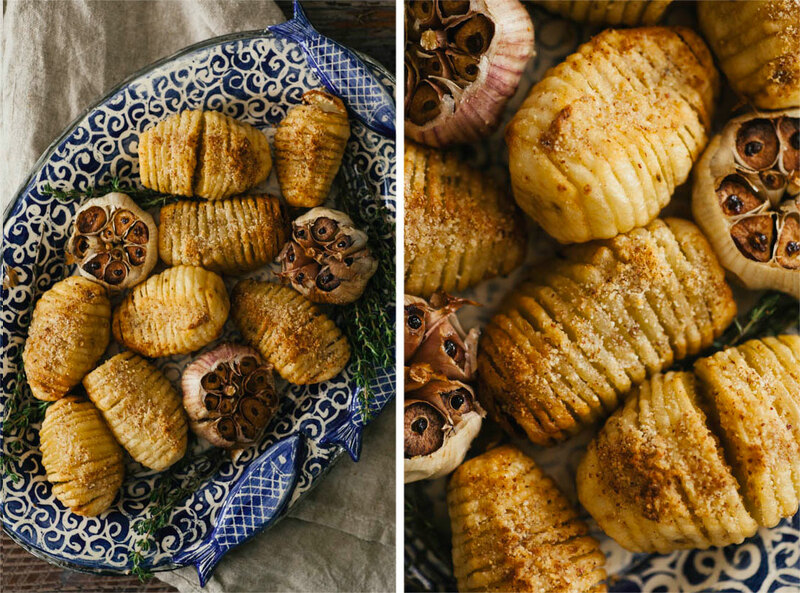 It’s the yummiest of Swedish potato recipes; the Hasselback. 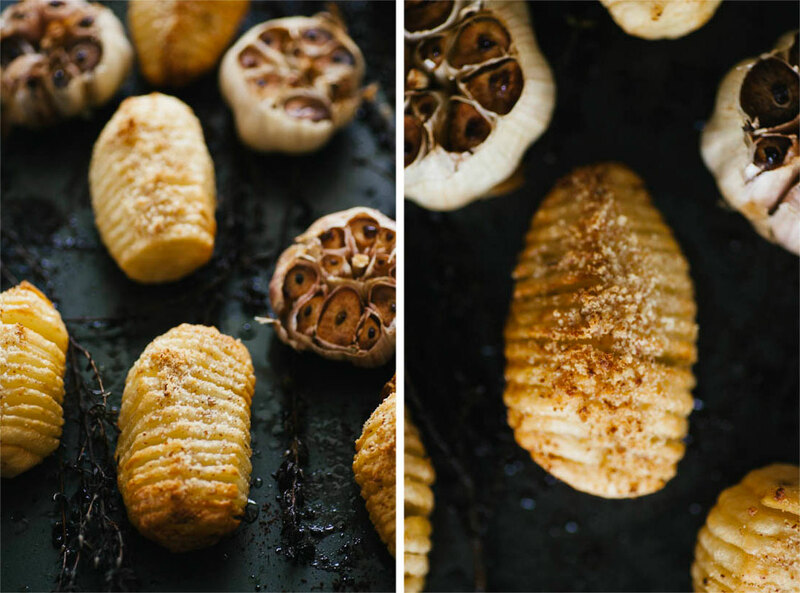 These roasted potatoes are enhanced by the fact that you slice them before roasting which gives you extra crispy potatoes, and who doesn’t like that?! I know I like it anyway and hope you will too. Traditionally these potatoes are cooked with butter and bread crumbs but since I don’t eat butter as such I swapped that for rapeseed oil which I think has a nice flavour in recipes like this. The bread crumbs are also something I don’t use in my cooking so I decided to try these taters with almond meal instead and it tastes pretty fab. Personally I enjoy the nutty flavour it gives the potatoes but if your stomach is okay with gluten (or maybe you have some gf bread crumbs lying around?) you can of course go right ahead and swap my almond meal back to bread crumbs. Finally I’d like to wish you all a fantastic Christmas holiday filled with yummy food and lots of chocolatey treats! And remember that if the family gatherings get manic take three deep breaths and put your experience into perspective; if you have a family to gather with over Christmas, if you have a luscious Christmas meal lined up and maybe even some gifts under the tree you are a lucky person and I think this is always something to embrace and celebrate. Now enjoy and Merry Christmas! Peel the potatoes. 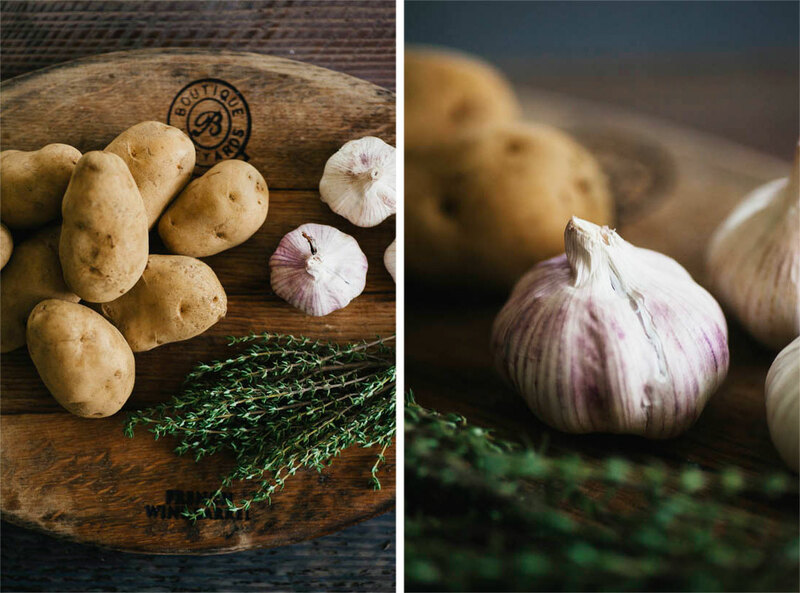 Place a potato at a time on a wooden ladle and cut 3 mm thick slices into it, without cutting all the way through. The ladle should help keep the potatoes in place and can also help with not cutting all the way through. 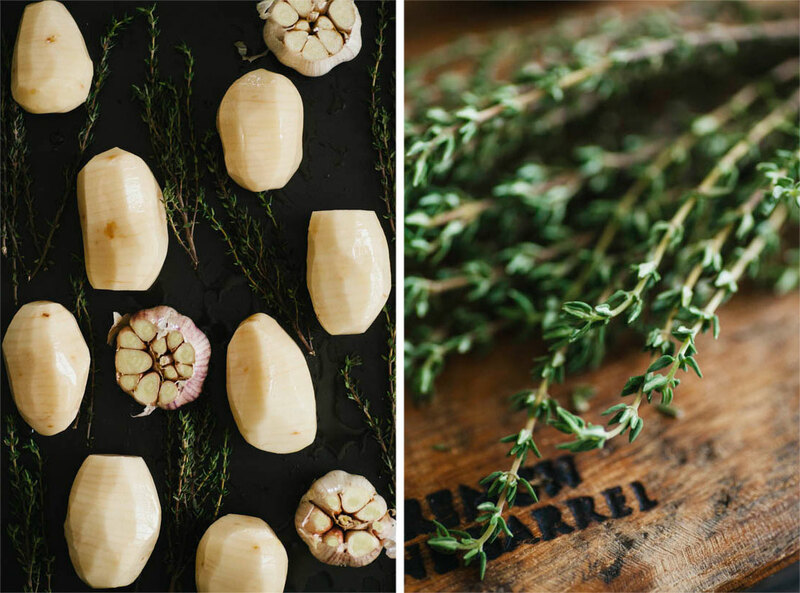 Cut tops of garlic bulbs so that you can see the cloves. Get the aromas out of the fresh thyme by smacking something hard, like the end of a knife, onto the leaves. Then place on an oven tray. 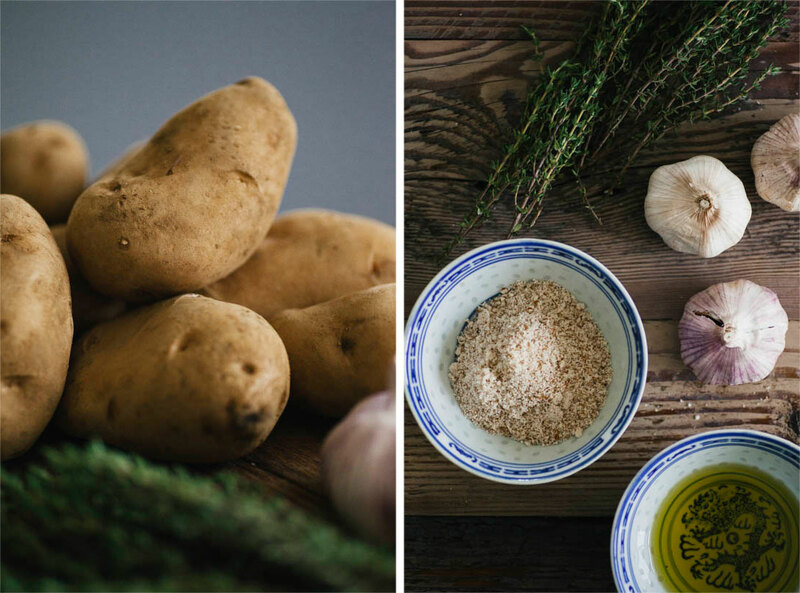 Dip each potato into an oil with a high smoke point, a good quality rapeseed oil will do well. Coat the potatoese and place on the oven tray next to the thyme. Also dip the garlic bulbs into the oil so that the cut side is coated and add to the oven tray. Place in the middle of the oven for 20 min. Take the potatoes out of the oven and pat with more oil. Then sprinkle the almond meal mixed with a pinch of salt on top before returning to the oven. Check on the potatoes every 5 min at this stage, dabbing with oil if needed. 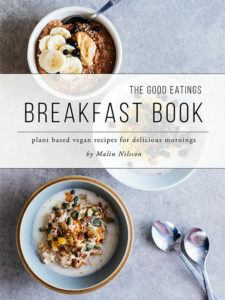 Make sure the almond meal or garlic bulbs don’t burn. Ones the almond meal has turned golden and the potato slices has turned slightly crsip the potatoes are done. And ones the garlic bulbs are soft they are done too. 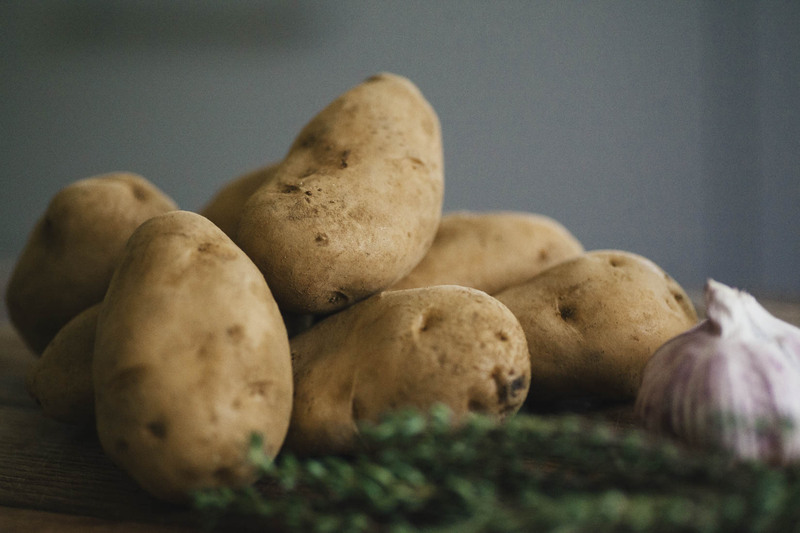 You might need to remove them at different times but all in all the complete cooking time should be roughly 35 min for smaller potatoes. As for the mushroom and quinoa balls – enjoy, they’re one of my favourites. Be aware that you might need to add a little more flour if they seem a little too sticky!